The high performance fiber rope DynaCam Static consists of UHMWPE fibers and a protective PES cover. It has minimal elongation and extremely high breaking force. 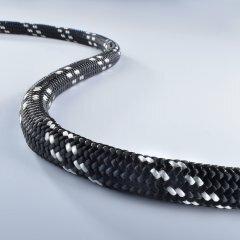 High performance fiber rope made of UHMWPE fibers and including a protective PES cover. Woven-in metal fibers dissipate static charges which obviously are generated by frequent passing. The rope demonstrates minimal elongation and extremely high breaking force.